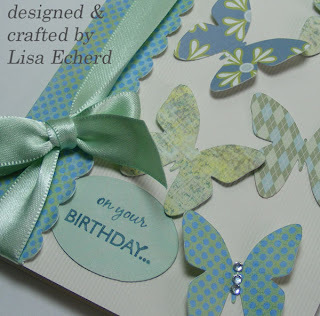 Lisa E Design Blog: Happy New Decade! 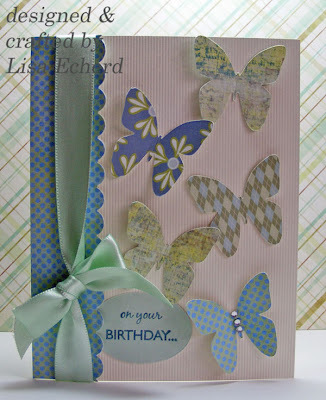 Butterflies signify life so this card seemed like a good one for the new year and new decade. Where were you when the last decade rolled in? We actually went to bed early on December 31, 1999 with an alarm set so we would wake up and be awake for those few minutes before midnight. We got up about 11:45 p.m. and saw in the new millennium. The world didn’t come to an end, so we went back to bed. Can you believe it has been 10 years since we celebrated – or slept our way into - the new millennium. Amazing things – both marvelous and horrifying - have happened. Many wonderful things have happened in my life. I got married, had my most (and least) lucrative years career wise, tried different careers, acquired a design certificate, learned new hobbies, traveled to Australia and several other fun places, helped my oldest stepdaughter with her wedding, became a step-step-grandmother, and threw my parents a fabulous golden anniversary party. I also lost some really dear people in my life this decade that I miss every day. I’m thankful for all those who are still here to usher in 2010. May the 20-teens be the best ever! And now, back to those resolutions I was yammering on about yesterday. I like to keep my objectives private but here is one of my New Year’s Resolutions. I’m trying three again this year. If I made it through 2 last year, maybe I can make all of them this year. "I will complete Project 365." Are you familiar with Project 365? You commit to taking at least one photo every day and scrapbooking photos weekly. I’ll talk more about what I want to do with the scrapbooking part of this in a later post. So that is one of my resolutions and probably the most time consuming. I've really been looking forward to this projecct and have lots of ideas. What are you committing to this year?